Knowing something you do is bad for your health doesn't necessarily stop you from doing it, which is why you probably drink soda from time to time despite knowing better. While you'd be hard-pressed to find a doctor who'd recommend drinking a can of Diet Coke a day, new research suggests that it's not one, but two or more regular or diet soda servings a day that could really put you at risk — at least when it comes to your heart health, according to a Swedish study recently published in the medical journal, Heart. In the study, researchers tracked soda consumption and risk of heart failure among more than 42,000 men over 12 years. 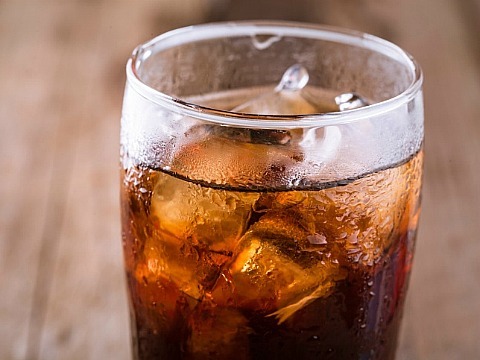 Those who drank at least two soda servings a day had a 23 percent greater risk of developing (and in 509 cases, dying from) heart failure during the study. The study authors didn't differentiate between sugar-sweetened beverages (like Cola-Cola) and artificially sweetened sodas (like Diet Coke) — so for all intents and purposes, diet and regular sodas appear to contribute equally to heart failure risk. While the study was thorough and the stats seem pretty solid (researchers even excluded participants who developed heart disease early in the study just in case the prognosis somehow led them to turn to soda as a vice), the subjects are still men in Sweden. So their gender or lifestyle factors, or even something in the water there, could have skewed the results. Because it would be silly to wait for researchers to prove that soda is good for your heart — Not. Happening. — there's no time like the present to cut back on your consumption if you're plowing through two cans a day.